Oiling is a vital part in maintaining the hair health. But, due to busy schedules, many people skip it and simply wash their hair without oiling them. Our mothers and grandmothers have been saying this for decades that oiling the hair strands and scalp can actually do miracles. Pollution just worsens the issue and people face problems like hair loss or their hair stop growing. Oils help in the blood circulation of the scalp that works great for hair growth. Oiling can really be the required change to maintain the healthy and lustrous hair and to get back the lost hair. Some of the best hair oils to promote hair growth are mentioned below. 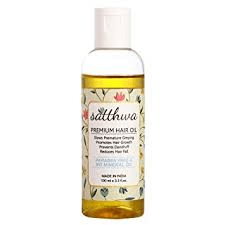 Satthwa premium hair oil is a mixture of 9 different oils that help to cure various problems such as hair fall, premature greying, dandruff and it also promotes hair growth. The infusion of various oils in the Satthwa hair oil includes olive oil, castor oil, coconut oil, amla oil, grapeseed oil, almond oil, Vitamin E oil, emu oil, and jojoba oil. These oils help to nourish the scalp by making it healthy and promote hair follicles to grow. Its anti-inflammatory and antimicrobial properties maintain the health of the scalp and control dandruff. It might take 6 months to get thick hair stands, but be patient because it is a slow process. This oil is suitable for all hair types. Bhringraj is a great ingredient to fight hair loss and to regrow the lost hair while curing dandruff and Forest Essentials Bhringraj Hair oil is loaded with it. Thus, it acts great for problems related to hair loss. It tends to improve the overall structure of hair with its nourishing herbs that include goat’s milk, sesame seeds, herbal and Bhringraj extracts, and virgin coconut oil. This oil also works on premature greying of hair strands and protects the hair from harmful UV radiations of the sun by forming a protective layer. Due to its deep penetrating properties, the oil gets deep into the roots and promotes faster hair growth. Forest Essentials Bhringraj Hair oil is a great oil that caters to many hair problems and one must give it a shot to have long, healthy hair. Strengthens and nourishes the scalp. Khadi is the brand that is known for herbal ingredients in its products. Even its hair oil contains pure and natural ingredients that are rosemary and heena. 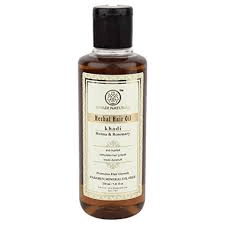 Khadi Ayurvedic Hair Growth Oil- Rosemary & Henna Hair Oil helps to prevent hair loss, baldness, breakage, split ends, etc. By curbing all the problems related to hair, this oil helps to regrow lost hair. It can be used both by men and women to cure their hair problems. It does not contain any parabens or mineral oils. The oil comes with anti-oxidants, purifying and anti-inflammatory properties and feels very light and non-sticky on the scalp. It is suitable for all hair types. Usage: When applying the oil, part your hair and apply it all over the scalp. Massage the scalp gently with fingers in a circular motion and let it remain for an hour or more before washing. It can also be left in your hair overnight. 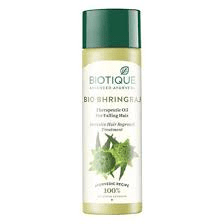 Another brand that is famous for its natural ingredients has a very effective hair oil to stimulate the growth process, which is the Biotique Bio Bhringraj Therapeutic Oil. This oil nourishes the scalp with the blend of ingredients such as amla, bhringraj, centella, coconut oil, butea frondosa and goat milk. All these ingredients help to stop falling of hair, baldness and other hair loss problems while stimulating the growth of hair follicles. It also prevents premature greying of hair. Biotique oil conditions the hair by making them soft, shiny and manageable just by a single use. Its light and pleasant smell feel very fresh. This one is more suitable for oily scalp. Might not work wonders for everybody. Help diminish greying; How to use: Apply liberally to dry hair and scalp. Massage in gently with circular motions. Leave on for half an hour. Rinse well with water. 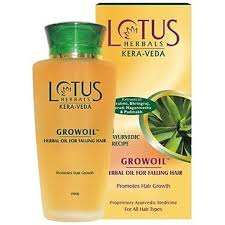 Lotus Herbals Kera-Veda Grow Hair Herbal Oil is known to show significant results for falling hair. One can get the results after the minimum and regular use of 45 days. This is an ayurvedic oil that helps to stop falling, premature greying and promoting of hair growth. One can use the oil to curb headaches and sleeplessness by massaging in the head before sleeping. It does not contain any parabens and is safe to use by everyone. 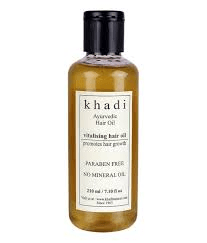 Another one from khadi brand is the Khadi Ayurvedic Hair Growth Vitalizing Oil. This one is specifically prepared for the growth of hair follicles. Its ayurvedic ingredients make the scalp healthy and nourish it so as to promote the growth of healthy and long hair strands. It helps to cure falling of hair by preventing split ends and breakage, which are the main causes of hair fall. It strengthens the roots of the hair and makes them soft and lustrous. This ayurvedic hair oil is ideal for all hair types. Prevents split ends and breakage. Shahnaz Hussain Shalocks Ayurvedic Hair Oil helps to prevent dandruff, hair loss, premature greying and promotes hair growth. It keeps the scalp clean, clear and healthy because only a healthy scalp can grow healthy hair. The oil is loaded with natural ingredients like Amla Extract, Shikakai Extract, Almond Oil, Brahmi Extract, etc. which promotes hair growth and curbs all the hair loss problems. This oil is suitable for all hair types. 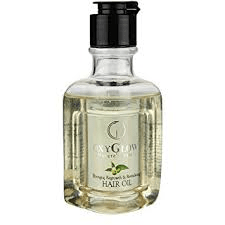 Another hair oil that helps to promote hair growth is the Oxyglow Bhringraj Regrowth Hair Oil. This oil contains bhringraj along with other oils like coconut oil, groundnut oils and flax seed oil that help to strengthen the hair follicles by working on falling hair and stimulating hair growth. The formula is non-sticky and has a pleasant smell that remains all day long. Also, this oil cures and prevents dandruff and makes hair smooth. Make hair non greasy & detacky. Anti dandruff property- Helps in controlling dandruff. Make hair smooth, soft, silky & shine. Another Khadi hair oil for hair growth is the Khadi Brahmi Amla Hair Oil. This oil contains many ingredients like Amla, Brahmi, Shikakai and Bhringraj that work for the hair fall problems and boost hair growth. This oil also helps to cure dandruff while making hair soft with its conditioning properties. The oil also contains heena, which helps with premature greying of hair. The oil is suitable to use for all hair types and gives good results to stop hair fall. Prevents premature greying of hair. 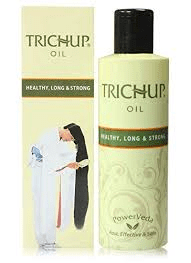 Trichup Healthy, Long and Strong Hair Growth Oil contain natural ingredients like bhringraj, coconut oil, neem extract, etc. These ayurvedic ingredients work for the growth of hair follicles and prevent excessive hair loss. It helps in preventing greying and fall of hair, dandruff and makes hair shiny and thick. It also offers protection from dust, pollution and harmful UV rays of the sun. The oil is more suitable for dry hair type. Loaded with effective herbal ingredients. Makes hair shiny and thick. Protects hair from UV rays and pollution. 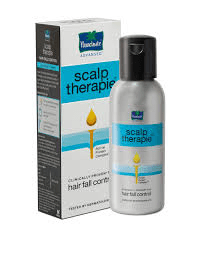 Parachute Advanced Scalp Therapie Hair Oil is an effective oil to boost hair growth. This oil is blended with coconut, Brahmi, hibiscus, amla, and Vitamin B and E oil that makes hair soft, smooth, shiny, long, thick and healthy. It has a medicinal smell and is non-sticky. There is no mineral oil, but all natural oils. It helps to prevent loss of hair and boosts the growth of hair follicles. It gives the required proteins and minerals to the scalp to nourishes it. Usage: Regularly massage on scalp and apply across the length of the hair till tip for best results. The herbal hair oils work best for the growth of the hair as they don’t contain any chemicals or parabens, so they don’t harm the hair in any way. The two best hair oils for hair growth from the above-mentioned list are Khadi Ayurvedic Hair Growth Vitalizing Oil and Forest Essentials Bhringraj Hair oil due to their herbal ingredients that promote faster hair growth. Do massage the oil well into the scalp and let it penetrate deep into the roots for at least 2 hours or overnight before washing it off with the shampoo. One can also steam the hair by using a warm wet towel to let the oil penetrate easily into the scalp for effective and maximum results. The information on this website has not been evaluated by the FDA and is not intended to diagnose, treat, prevent, or cure any disease. Please consult a healthcare practitioner before making changes to your diet or taking supplements that may interfere with medications.